Discussion in 'RPG Archives' started by BnKRPG, Mar 17, 2006. .about the ultimate dc rpg. however this one follows a different, non-established 'Ultimate' continuity, similar to Marvel's Ultimate series.
. the 'Ultimate' World: History and Parameters of the Ultimate DC Universe. The following posts contain, the parameters and history of this universe. Use these as a starting point, to get to know this world. What you do in it and how your character reacts in it is entirely up to you. Players can choose any DC Comic character they wish, and ''Ultimize'' them. Since there is no established Ultimate continuity for DC, some liberties can be taken. However, We ask that you at least try and stay true to the character's basics. (IE: Superman's an alien, Batman's a mortal, Wonder Woman's an Amazonian warrior, ect.) Don't make him or her completely 100% different from his/her's Regular DC counterpart. This is in an Ultimate DC continuity. Meaning, this does not tie into the continuity of DC Comics. (IE: Superman never died, Batman was never broken by Bane, ect.) So don't play as if any of that has already happen. This is a NEW universe. No Killing. Unnamed faceless NPC's (*Non Player Characters) are okay, but not comic characters. Someone else may want to take up the character, or they may be imporant to another story. You can go anywhere on earth, or travel off planet, but do so within your character's means. You are your character, so act like it. Talk like them, use their dialogue. Do not exaggerate their powers or abilities, or pop-up here and there without explaination. Several stories can be going at once, and you have the freedom to interact with other characters. You must post every two weeks, though it is preferred that you post more. If you go two weeks without a post without prior notice, your character is be up for grabs. All regular Hype rules also apply.
. a hero is no braver than an ordinary man, but he is braver five minutes longer. .there are heroes in evil as well as in good. ( ) = Reserved Characters. Paranormal Activity: Paranormal activity is more or less the stuff of fantasy and the occasional tabloid rumor, as it is in our world. The Justice Society did exist, but the government kept their existance a secret, and had DC comics produce comic books based on the members of the society to make sure that any sightings were laughed at by the public. Technological Advances: America has experienced a great deal of technological advancement over the past few years, due mostly to the scientific acheivements of super genius billionare philanthropist Lex Luthor, and his company Lexcorp. However, while some cities like Metropolis are briming with the new technologies, some, like Gotham, are very much like they are now (or maybe even a few years behind now) due to a lack of city funds and overall impovershment in the city. Hero Activities: Not every hero would be very public. Most wouldn't be. The most public heroes would, probably, be The Flash and Wonder Woman. Heroes such as Superman, Batman, The Question, Green Arrow, and others, would be considered urban myths, for the most part. Magic: Magic exists, although it's far different from "say a few incantations and wave around a few trinkets". Magic isn't a defyance of the laws of physics as much as it's a different form of manipulating them. Much more natural that science, but in some ways similar to it in aproach, and based on many scientific principals. As in, the laws of conservation of mass and energy are intact. A sorcerer can't get around them no matter how hard they try. Much of sorcery is based on the idea of enhancing the mind's ability to perceive the world around it. The mind is capable of many a wonderous thing, sunch as psychic ability. But, without some form of genetic enhancement, it takes years of training and use of specialized herbs to tap into these abilities. When one does (and most who atempts fail, it still takes an inherent gift for the craft to acheive), they are capable of generating orbs of energy, defying gravity, sensing the immotions and thoughts of others, astral projections, and other feats like that (people such as yogis and far east monks have displayed abilities like this, although they are very small in number). However, the greatest acheivement in sorcery is what is called the "schrodinger's cat" vision. Basically, the schrodinger's cat theory of physics states that the universe is based upon our perceptions. There are milllions upon millions of quantum posibilities in the universe, and what happens in our universe is based upon the quantum posibility we see. High level sorcerers who have atained the "schrodinger's cat" vision have heightened their awareness of the universe, enabling them to tune in on other quantum posibilities and bring them into reality for breif periods, thus effectively altering reality. Gods: Gods, such as the greek and norse gods, did not exist at first. But because people believed in them, they do now. You see, poltergeists are suposedly spiritual entities created from the immotions and thoughts of people. Mind over matter. It's been shown to be at least somewhat possible before. Now, if thousands, amybe even millions of people not only think of something but believe it exists for centuries, could that thing come into existance? In this world, it can and did. This is how the gods of mythology were born. And, because the Greek gods have people still worshiping them in the form of the Amazons, they are the most powerful of all the pantheons. Space: The universe is held together by a united federation of planest, that has been together for millions of years. The main base if the UP is on the planet Oa. The Oans head up security and law enforcement throughout the universe, in the form of the Green Lantern Corps. The corps maintain order throughout the universe, although they don't interfere with political afairs. They just save lives. Atlantis: The original Atlantians are long dead. Atlantis is know populated by marine life who, due to centuries of us poluting the waters, were mutated. One mutation was humanoid and highly evolved, and this spread, creating Atlantians as they are now. They found Atlantis, and mastered the ancient technologies there. Life in Atlantis would be akin to ancient barbaric tribes. Alien And Martian Life: Mars was wiped out by civil war between the green martians and the white martians. Technically, there is no biological difference between the two races, but since they are shapeshifters they choose different average froms to diferentiate between one another. J'onn is the last survivor of Mars, and was accidentally transported to Earth during the final battle that wiped out everyone else. He's been on Earth since the early 50s, and has recently fallen into a deep depression after the Mars probes reported no remaigning signs of life, which he is just begining to come out of. Themyiscara: Basically, the Amazons were a movement of female warriors in ancient times. While most were eventually wiped out, some, to avoid pursicution, left to an island in the pacific that exeriances regular storm activing, thus keeping the island safe from prying eyes. There, due to centuries of breeding and using steroid like preformance enhancing herds in their natural diet, the Amazons are naturally much stronger, faster, and more durable than normal human beings. There are men on the island, but they live seperately from the women and are basically second class citizens in the way that women were in America up until the early 60s. However, they only face this issue when they venture into the female villages. They have their own society in the male villages, although the man in charge of the male villages is subject to the Queen's law directly. The Amazons have technology that greatly enhance the phyisical abilities of their warriors, using surgury and inhalation of the gasses produced by a special groto in the capital city, which stimulate mutation that enhances physical ability. This procedure is almost never used, and has been used on Themyscera's ambassador, Diana. Her title, as ambassador, roughly translates to "Wonder Woman" in english. Basic History Of The Character: Born on the dying world of Krypton, baby Kal-El was sent to Earth to survive. On Earth, his apearance was altered from his natural form to blend in with the people of Earth. He was taken in and raised by Jonathan and Martha Kent. As he grew, he discovered that Earth's atmospehere gave him superhuman abilities. After graduating from college, he wandered the world, gaining experiance and using his powers to help others wen necesairy. After a few close calls, he and his parents fasioned a costume from materials in his ship, and a means of hiding his physique and drawing suspicion away from himself through the simple use of fake glasses, a bad hair style, and baggy clothes. 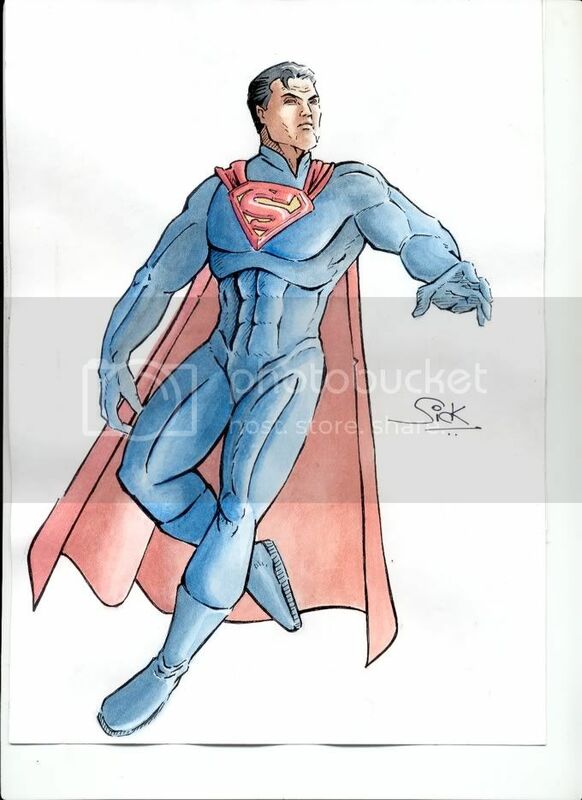 He has now moved to Metropolis, where he spends his time as a reporter for the Daily Planet, and Metropolis' mysterious saviour from the skyes the citizens have dubbed "Superman". 1. He's a classic DC character. 2. His nature as an alien raised in a classic american family gives for interesting character developement. 3. I've got a **** load of great ideas for Ultimate Superman. What Do You Plan On Doing With This Character As A Person: Flesh out the fact that he's a human being. Well, he's not actrually a human being, but you get what I mean. He's got feelings and dreams and sad days and happy days and secret crushes and dirty fantasies, just like the rest of us. Superman is as symbol. An idea to inspire you and to look up to. Clark Kent is a man. A man who can juggle cars, but a man none the less. Two Complete Sentances In Proper English Explaining What You Can Bring To This RPG: I'm a good writer. I can also expand on the ideas of others quite well. Do You Know How To Post Pictures On The Hype? : No. Basic History Of The Character: Young Bruce Wayne watched as his parents were slain infront of him in a random mugging, and he vowed to rid the world of evil that manifested itself in Gotham City. So, using his inherited wealth, He traveled the world and learned from the greatest warriors and minds to aqquire the skills that he needed to accomplish his mission. Once returning to Gotham City after many years abroad, Bruce also aqquired the weaponry he needed. Realising he also needed intimidation to better his enemies, Bruce donned the garb of a fearsome Bat, and became The Batman. 1. I've dreamed of reading an Ultimate Batman comic. I don't see All Stars as Ultimate... I see it as All Stars, and enjoy it as such. But I want to put my own spin on a different take of everybody's favorite Caped Crusader, and this may be my chance to do so. 2. He's Batman. BATMAN, for godsakes. If you don't know who this guy is, you should be slapped, beaten, and castrated, all at once. Without one doubt, He is my favorite character in fiction, period. If the freakin' Dark Knight isn't enough, I've been told I am good at this. So I assume I can bring good writing and action aswell as characterisation. One other thing I want to bring in is a Batman whose standout attribute is his mind, not his brutality (Though he'll have some of that, too). 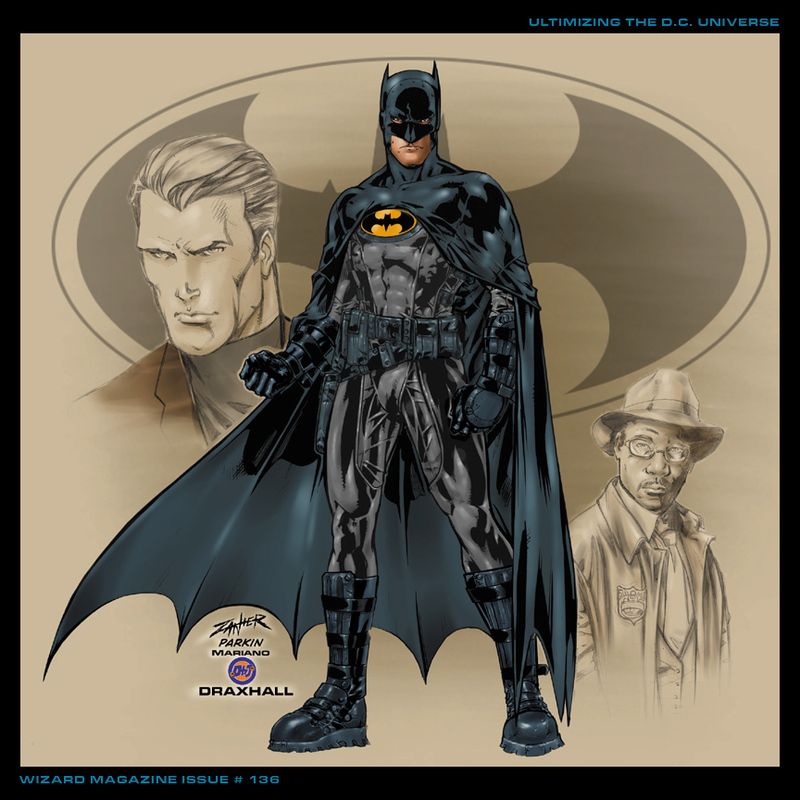 This Batman is going to be the DETECTIVE first, Dark Knight second. ...I'd give that a 'yep. Even though it's not really nessacary, with you being the co-Gamemaster and all o)... You're accepted. Much thanks. As are you. Basic History Of The Character: Dinah Laural Lance, the last born and only daughter in the family was born to Dinah Drake-Lance and Larry Lance, a Private Investigator. Dinah Drake was the costumed hero known as The Black Canary during World War II. She fought in the battles unseen among the Paranormal Battle fronts of Europe, before settleing down and marrying. In the 70s Dinah was born, the youngest child with two older brothers. Joshua, the oldest, Howard, the middle child, However, there was something different about Dinah. Possibly because of the strange things her mother was exposed to during the war as the Black Canary, Dinah was born with inhumanly powerful vocal cords, enabling her to produce crippling noises when she screamed her loudest. This, of course, made her a hassle to deal with as she grew, but the family adapted. When Larry died of cancer in the early 90s, Dinah took over his private detective agency. Renaming it "Black Canary agency", she serves as a detective for hire in Gotham City, often working with the new local vigilante, known as "The Batman". 2.Ive played her often in several RPGs, in several different characterizations and Id like to try her again. What Do You Plan On Doing With This Character As A Person: Id like to develop Dinah not only as a costumed hero but also as a woman. A Female who goes through the same heart break a normal human would, love, confusion, mourning and anger. Two Complete Sentances In Proper English Explaining What You Can Bring To This RPG (As A Player): I think I have enough ability through previous RPG experiences to bring something to the RPG. However I also bring an open mind and a willingness to listen to others opinions. Do You Know How To Post Pictures On The Hype? : Deed I do. Basic History Of The Character: A young cancer patient who seemed destined to wither away in a hospital bed, Conner Kent&#8217;s parents sought help from every charity and corporation to pay for what seemed to be his last days on Earth. One of these corporations was Luthor Corp. Promising a cure for his disease, Conner ignored his parent&#8217;s objections and allowed tests and experiments to be ran on him. 2 years later his body recuperated fully and he gained telekinetic abilities to boot. Lex Luthor approached the young man in person about honing his skills to become a public icon and media hero in exchange for his loyalty to Luthor Corp. All to willing to repay Luthor Corp&#8217;s kindness, Conner accepted this deal fully. 2. He&#8217;s got powers that separate him from all the other S-Shields. 3. He&#8217;s not given enough respect, and I&#8217;d like to write a new take on him. What You Plan On Doing with This Character: I want to write him from a different angle.Namely, what if Conner was shown more kindness from Lex than Supes? Two Complete Sentences In Proper English Explaining What You Can Bring To This RPG: I love writing teenage characters. I&#8217;m especially good at doing angsty, emo teens. Do You Know How To Post Pictures On The Hype ? : I really like Gwen Stefani, lol. Any suggestions for Batman's speech? You are the guy to go to for that kinda stuff, after all. Basic History Of The Character: A young cancer patient who seemed destined to wither away in a hospital bed, Conner Kents parents sought help from every charity and corporation to pay for what seemed to be his last days on Earth. One of these corporations was Luthor Corp. Promising a cure for his disease, Conner ignored his parents objections and allowed tests and experiments to be ran on him. 2 years later his body recuperated fully and he gained telekinetic abilities to boot. Lex Luthor approached the young man in person about honing his skills to become a public icon and media hero in exchange for his loyalty to Luthor Corp. All to willing to repay Luthor Corps kindness, Conner accepted this deal fully. 2. Hes got powers that separate him from all the other S-Shields. 3. Hes not given enough respect, and Id like to write a new take on him. Two Complete Sentences In Proper English Explaining What You Can Bring To This RPG: I love writing teenage characters. Im especially good at doing angsty, emo teens. I would suggest this. It's what JRK and I always use when we write Batman's speach. Cool. PM me, since this has to do with Superman and all. Basic History Of The Character: As a right now Jonathan Crane is a very respected doctor working at one of the head position at Arkham Asylam. But Jonathan Crane has a few skeletons in his closets. As a child he lived on a farm with his alcoholic and abusive father. His father also blame him for his mother's death. Jonathan segregated himself from other people and stay in his room all day reading books allowing him excel in many of his classes. Although everynight as a child his father whould scare John with stories of monster that would come and get him if he steps out of line mostly pointing outside to the scarecrow which scared him the most. Then the day came where his dad killed himself, or so it seemed, and Jonathan was sent to live with his aunt and uncle in Gotham. There he graduated from Gotham U and worked up the ladder at Arkham Asylam. But Crane has been lowering into his psychosis. Rumors are flying around Arkham of screams coming from deep in the basement and also of a lanky boogeyman roaming the streets murdering people. Could there be a connection? 3. I want to bring my out take for him and make him a much more tragic character. What Do You Plan On Doing With This Character As A Person: Every since I was little watching BTAS Scarecrow was my favorite and then getting into comcis I love his appreances. This allows my to bring my own take to the character I enjoyed over the years. Two Complete Sentances In Proper English Explaining What You Can Bring To This RPG (As A Player): I'm a good writer. I would bring a good a deep villain. taskmaster We all float down here. This is a really cool idea. Can't wait to see the stories you guys come up with. I might, I have this habit of joining up with out having story ideas. Let me think about for a couple of days and keep Ultimate Deathstroke open, alright? Give me sometime to think about, can you hang on to Luthor for me at aleast for a few days. Will do. I've personally got plenty of ideas for Luthor, if you're interested. Well, the man is so obsessed with Batman he damn near makes ME look like a casual fan. And I'm not sure if I want to still do Robin, or perhaps do The Joker. Which would be better used at this point in time? Well, it's your choice. And Q's ideas for both are pretty cool... Both would make excellent additions to the game, and to Gotham. But, my opinion... You're good at playing psychopaths... and The Joker is the ULTIMATE psychopath. I'm interested to see what you'd do with him. Either way, I wouldn't complain. Find a Batman pic you really, really like, PM it to CConn, and tell him you want an avvy of it. That's where I get mine. Basic History Of The Character: While a student at Keystone State University, Barry was working on his final chemistry project; a serum that would increase reaction time and alertness, much like a highly potent energy drink. He was having no luck and was about to chalk it up to a failure, when his lab got struck by lightning. In addition to frying his notes completely, the lightning destroyed his working sample and put Barry in a coma. When he woke up weeks later, he found that he had been instilled with superspeed, but could no longer remember the steps to making his serum to mass produce it. Taking after his favorite member of the old Justice Society comics, he became the Flash. 1. I've always liked the Flash's and have some interesting ideas for the character. 2. It should be fun to mess around with someone who just found out he can move at superspeeds. 3. I like the fresh start approach of this RPG. What Do You Plan On Doing With This Character As A Person: Well I really plan to play him alot like if I just somehow got superspeed. Pretty selfish at first and selfless later. Well, people seem to like my portrayal of Arsenal in the DC RPG, so I would like to think I am a good roleplayer. I can also add a touch of light heartedness, as I crack jokes that may or may not be funny. Yes, and I'll work on my own designs for Barry when I get off work tonight.